Artist Susan Monty is a New England native who grew up in Windham and now resides in Derry, where she works out of a studio in her home. She works in diverse media including colored pencil, pastel, acrylics,and oil to capture a realistic, but artistic, likeness of her subjects. Her love of nature and animals, especially horses, is evident in her choice of subject matter, which ranges from house pets to wildlife to New England landscapes and seascapes. like running my hands over its body as I work. I feel the life as I paint." She grew up the typical "horse-crazy" girl, and along with her best friend, Leslie, lived and breathed horses. "I remember tying ropes to our bicycle handlebars and pretending they were reins." Susan finally convinced her parents to get her a horse, and Scout came into her life. He would be a treasured friend for 28 years and is fondly missed and remembered. The painting "Pieces of Me" shown below is a portrait of Scout and has great sentimental value to Susan. Susan’s award winning work has been accepted into numerous juried and gallery exhibits around the country. 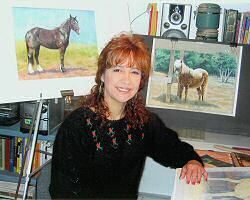 She has had paintings selected for the Equine Art Classic held in conjunction with the Kentucky Derby, the Colored Pencil Society of America’s 15th international art show, and HITS-on-the-Hudson’s Art Exhibit and Auction. Her paintings have won ribbons at recent events sponsored by the GSAA, the SAA, and the Deerfield Fair. Susan was a member of the creation team for the mural mosaic project la Cadeau du Cheval. 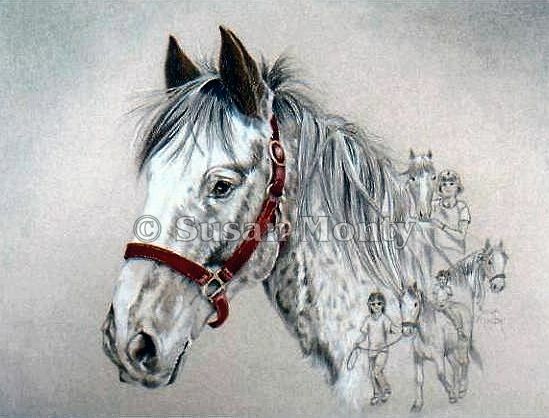 She was also a featured artist in Northeast Equestrian Life magazine, Sidelines magazine, and an article about her art and how it relates to horse rescue appeared in Horses In Art magazine. Three of Susan's oil paintings: Mustang Games, Dining Alfesco, and There Lived a Wild Mare were selected to be a part of The Horse: Spirit, Art, and Soul. This exhibit features work by the signature members of the International Equine Art Group and was held at the International Museum of Art of El Paso during August and September of 2014. 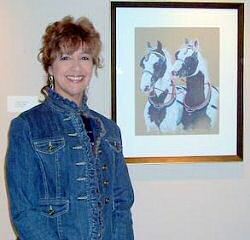 Susan is a signature member of the International Equine Artists Group. Susan is an art instructor for Derry Adult Education. "I love teaching adult education. I’ve met so many interesting and wonderful people. I enjoy passing on my love of art to others."